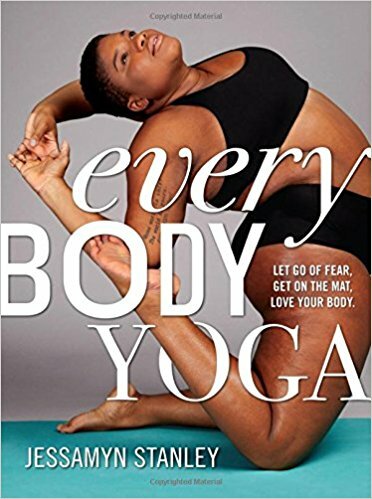 Every Body Yoga by Jessamyn Stanley is a book that tackles body image, the fundamentals of yoga, the history of yoga, and much more. I’m not writing a full review of this book because I didn’t read the entire thing. There’s a giant block of the book devoted to how to do specific yoga poses. Given that I’ve been doing yoga for two years now, I’m already familiar with these poses* and thus skipped that section. I read the rest, however, and feel like this is a really good book that more people need to read. Compromise: Write a not-review on my Wellness Wednesday series! The book is segmented into five sections. There’s a general section on current yoga practice and the way the author isn’t exactly the standard model of what America thinks when they think about yoga. There’s a history of yoga combined with a comparison of the ancient practice versus the modern practice. This section also includes a guide to the different kinds of yoga currently out there, as well as a discussion on the full breadth of the practice (which includes far more than the fitness/poses aspects). Then there’s the actual poses laid out in text and photo. These are the ones I skipped, though I can say they are well done and I wish I’d had this book back when I started! Then there’s a memoir-like section tied in with various yoga sequences, and a conclusion section. I think there’s a lot to be gained from the book. Some parts were more interesting to me than others. I’m not really much of a memoir person, for instance, but I loved learning more about the adaptation of yoga over time and the parts of the practice not usually tackled by modern-day classes. In fact, I want to get my hands on a copy of this book (I currently have the library’s copy) just for the in-depth discussion of the eight-limbed path. ** I like that Stanley included references to other resources, and that she included photography of yoga poses not just of herself, but of other people who may not normally fit the thin-blond-white-suburban-mom image normally in popular yoga portrayals. Additionally, she’s the first person who’s gotten me interested in trying out a personal fear of mine, the Bikram yoga class***. On a more personal note, I find Stanley to be extremely inspirational. 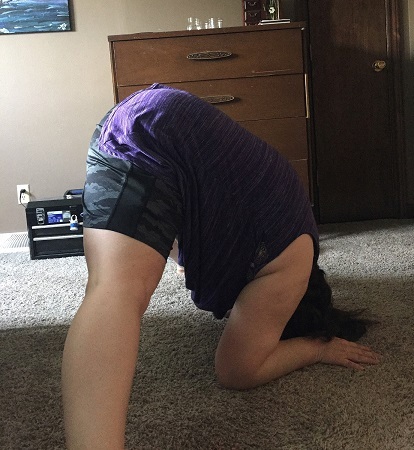 As a plus-sized person myself, it’s amazing to see what yoga can help a body to do no matter your size. I’ve definitely had increases in my flexibility over the last few years (see pics! ), and I hope to increase that even more in years to come. I have a lot to learn, but people like Stanley give me a lot of hope. *Except the dolphin pose. I’ve never seen that one or been asked to do anything like it in my home practice. I definitely need to try it out. **Haven’t heard of it? Neither had I before reading this book, and I’ve been doing yoga for two years now. I highly recommend either looking it up or taking a peak at this book. Stanley explains far better than I ever could. ***This involves doing over an hour of yoga in a boiling hot and super-humid room, which generally sounds like a nightmare. This entry was posted in Book Talk, Wellness and tagged body image, fitness, Wellness Wednesday. Bookmark the permalink. Bikram yoga has always sounded interesting to me. I would love to see how limber I am after all that time in the heat and humidity. I tend to exercise better in that type of weather anyway. Dolphin pose? I am going to have to look that one up. I really need to find a yoga studio around here. I could do it at home but find I do better with exercise when it is outside the home. I tend toward heat stroke in that sort of temp/humidity, haha, so I don’t know if it would work for me. But I’d never thought about limbering up because of the heat, so I think it would be interesting to try. If I didn’t faint. Jessamyn Stanley is one of my favorite yoga practitioners because she is so real. I like her instructional style – I have learned so much from watching her videos and reading interviews from her. I didn’t know she has a book out – I will definitely have to check it out! Does she have online videos or just ones to buy? I mostly follow along with Adriene (Yoga With Adriene) because her stuff is online and I adore her, but it would be nice to have a variety of instructors to learn from. I get such a strange feeling about reading about fitness. I always feel like I should just be up doing the exercises (or moving around in someway), rather than reading about it. But I like the idea of a memoir kind of approach much more than a “reading guide” or whatnot, the sort of thing that comes with a Jillian Michaels or P90X program, for example. And of course, books like Born to Run or The Art of Walking are great, too. 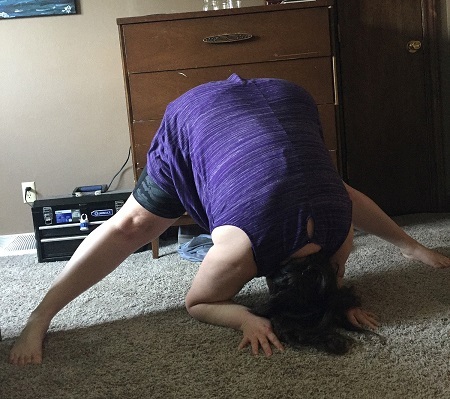 My old supervisor started doing Bikram after a severe back injury and found that it really helped her pain, more so than traditional yoga, because of the heat. My coworker tried it and really had to up her water intake after her first class. Having grown up in a very hot climate (you know that story too, I know! ), I’m pretty familiar with how I react to heat, and that’s what worries me. Maybe having the cooling a/c afterwards would be nice. But I’d still like to try it. Sadly, they don’t have it around where I’m at right now. I’ve been thinking about yoga a lot lately. I’m getting a lot of exercise at work, since there is so much walking involved and I’m breaking down the load 4 days a week, but I want to add something more relaxing. I used to like doing it before bed since it helped me relax. But my roommate is usually hanging out in the living room when I get home and I don’t like exercising in front of people. In fact, I stopped doing yoga when my mother started coming down to the basement to see what sort of exercise I was doing when we both lived in Fort Collins. I think maybe I’ll get this book at the library and try doing yoga a few days a week when my roommate ends up going to work before I get home. My favorite is Yoga With Adriene. All her videos are up on youtube. She’s from Austin and sounds like it (ha!) and I generally just use her videos on a mat in my room, so no one is watching me. I’ve been using her vids for two years now and I still love her to pieces.